It is believed that for centuries in the Hindu Kush and Karakoram mountain region villagers have been practising something called glacier growing (or glacier grafting). Yes, literally making their own new glacier. This is done in order to increase the water supply for crops, for survival. In order to encourage the growth of a glacier local farmers acquire ice from naturally occurring glaciers, and carry it to high altitude areas where the ice is put inside a small cave dug out in a scree-slope. Along with the ice other ingredients such as water, salt, sawdust, wheat husks and charcoal are also placed at the site. It is believed by the local people that there are male and female glaciers. The male ones, they believe, are covered in soil or stones and move very less. 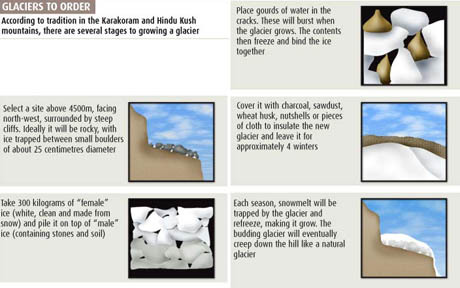 While the female glaciers are whiter, grow faster and yield more water. It is also believed that to grow a glacier, equal amounts of both sexes are needed.